You are at:Home»iPhone»Repair»Can You Fix A Broken iPhone Screen? Here’s The Truth! Your iPhone screen is broken and you don’t know what to do with it. 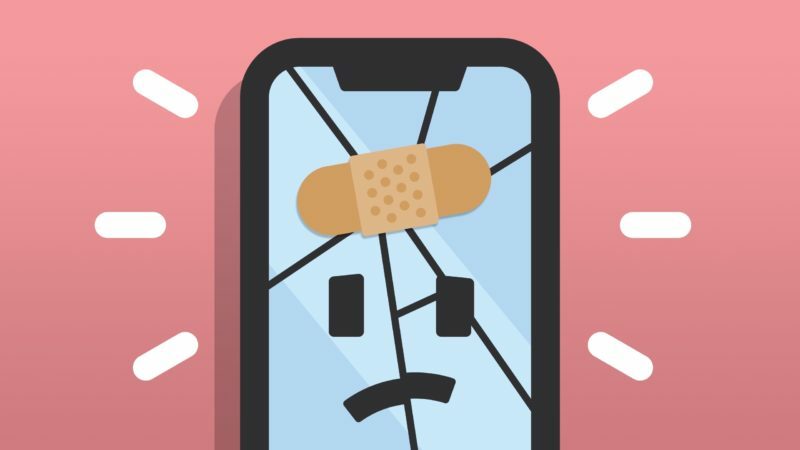 With a broken screen, you really can’t perform any of your iPhone’s essential functions like calling, texting, or using apps. In this article, I’ll explain what to do with a broken iPhone screen and show you where to get it fixed right away! A lot of the time, a broken iPhone screen is the result of a bad drop on a hard surface or water damage. Before exploring your repair options, try and assess the damage of your iPhone. Is your iPhone’s screen completely damaged? Are shards of glass sticking out of the screen? If there are, cover up the screen so you don’t get cut. We recommend using clear packaging tape, which won’t damage the screen or prevent you from having it replaced. If it’s only a small crack, you may be able to just put up with the problem. Shortly after getting my iPhone 7, I dropped it on my kitchen floor. Unfortunately, I hadn’t purchased a case yet, so my iPhone got a small crack at near bottom of the display. Since then, I’ve gotten a new case and hardly even notice the crack! If the crack or cracks on your broken iPhone screen are small, try putting up with it for a few days — you may not even notice it. However, if your iPhone screen is completely, move onto the next step — backing up your iPhone. Even though your iPhone’s screen is broken, there’s a decent chance it’ll still get recognized by iTunes. If your iPhone is recognized by iTunes, I recommend backing it up immediately. Plug your iPhone into your computer and open up iTunes. Click the iPhone button in the upper left-hand corner of iTunes, then click Back Up Now. After clicking Back Up Now, a status bar will appear at the top of iTunes. When the backup is complete, the time will appear under Latest Backup in iTunes. After backing up your iPhone, check the status of your AppleCare+ coverage. If your iPhone is protected by AppleCare+, you’ll probably be able to get your iPhone repaired for just $29 — if that’s the only thing wrong with your iPhone. Unfortunately, if you dropped it on a hard surface, or if it has been exposed to water, there may be other problems with your iPhone. There are lots of tiny components inside your iPhone, some of which can get easily knocked out of place. If your Apple Genius or technician notices that something other than the screen is broken, they may refuse to fix your iPhone. Is Apple The Best Option For Me? If your iPhone is covered by AppleCare+, and you’re pretty sure that’s the only thing wrong with your iPhone, Apple may be your best option. You can either set up an appointment at your local Apple Store, or use Apple’s mail-in repair program if there isn’t a retail store near you. Despite what they might tell you, Apple isn’t always the best option. A lot of the time, a company named Puls will be able to fix your broken iPhone screen at a lower price than you’d be charged at the Apple Store. Puls is an on-demand repair company that sends an expert technician to you who will fix your broken iPhone screen on the spot. They can visit you at home, work, your favorite restaurant, local gym, and many other places. You don’t have to drag the family to the Apple Store, fall behind on your work, or miss a meal or workout if you have Puls repair your iPhone! Puls also offers a much better warranty of the repair than the Apple Store does. Puls repairs are covered by a lifetime warranty, so if your iPhone screen gets damaged again, you can easily have it replaced! To get your iPhone fixed today, visit Puls’ website and fill out your information. A tech may be able to help you in less than 60 minutes! Could I Repair My Broken iPhone Screen On My Own? Theoretically, you could fix your broken iPhone screen by yourself, but we really don’t recommend doing so. Replacing an iPhone screen is an incredibly challenging process that requires expert knowledge and a special toolkit. Unless you’ve worked at an Apple Store or phone repair shop and have the special screen replacement toolkit, you really shouldn’t try and fix the screen by yourself. If something goes wrong and a cable or screw gets left out of place, you may wind up with a completely useless iPhone. And, if Apple sees that you tried to fix it on your own, they’ll probably void your warranty and refuse to fix it after you’ve screwed up. To learn more, check out our article on why you shouldn’t fix an iPhone screen yourself. Even though your iPhone screen is broken, you have a reliable repair option to get it fixed today. Next time you have this issue, you’ll know how to get the problem solved. If you have any other questions about the repair options for your broken iPhone screen, leave us a comment down below! Previous ArticleiPhone Stuck Preparing Update? Here’s Why & The Real Fix! Next Article How To Turn On iPhone: The Fast & Easy Guide!